Tom Benson Way Footbridge is a minor waterways place minor waterways place place on the waterways major waterways place village town city on the Ribble Link between Ribble Link Lock No 9 (Sea Lock with rotating gates) (2 miles and 2¼ furlongs and 5 locks to the west) and Ribble Link - Lancaster Canal Junction (¾ furlongs and 3 locks to the northwest). The nearest place in the direction of Ribble Link Lock No 9 is Tom Benson Way Bridge; a few yards away. 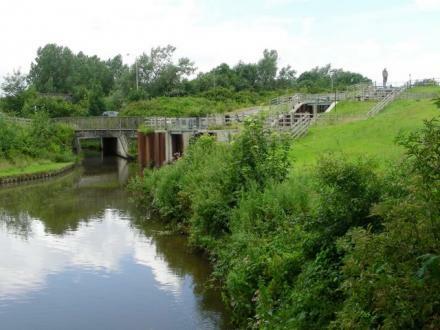 The nearest place in the direction of Ribble Link - Lancaster Canal Junction is Ribble Link Staircase Winding Hole; a few yards away. St. Anthony's Drive, Preston, PR2 3SQ — 1632 yards to the northeast. 442 Blackpool Road, Preston, PR2 2DX — 1285 yards to the east. Preston — 290 yards to the north. Merrytrees Lane, Preston, PR4 0NZ — 1420 yards to the north. 1240 yards to the southeast. Preston — 1124 yards to the northwest. 35 Greaves town lane, Preston, PR2 1PD — 1399 yards to the southwest. Armaside Road, Preston, PR4 0WH — 1565 yards to the northwest. The Bowling Pavillion, Ashton Walled Garden, Ashton Park, Off Pedders Lane, Preston, PR2 1HL — 907 yards to the south. 12 Elswick road, Preston, PR2 1NT — 1152 yards to the southwest. 11 granton walk ingol, Preston — 825 yards to the north. Preston — 699 yards to the southeast. 468 Blackpool Road, Preston, PR2 1HX — 1182 yards to the east. Preston — 1558 yards to the south. Preston, kent,United kingdom,pr21bx, Preston, PR21BX — 1551 yards to the southeast. Preston,kent,United kingdom,pr21bx Preston kent,United kingdom, Preston — 1551 yards to the southeast. Preston — 1112 yards to the northeast. Preston — 1180 yards to the south. Preston — 1021 yards to the southeast. Tom Benson Way, Preston, PR2 1SG — 887 yards to the northwest. lostock lane, Preston, PR5 5XU — 1507 yards to the southwest. Preston — 1242 yards to the southeast. 40 Lea Road, Preston, PR2 1TP — 1183 yards to the southwest. Preston — 1331 yards to the east. Preston — 1007 yards to the west. Preston — 1055 yards to the northeast. Dukes Meadow, Preston, PR2 7AS — 1469 yards to the north. 410 Blackpool road, Ashton on Ribble, Preston, PR22DX — 1390 yards to the east. Preston, PR2 3 — 1507 yards to the north. 280 Dunkirk lane, Preston, PR267SN — 1467 yards to the east. Preston — 1113 yards to the southeast. Preston, PR2 1 — 1284 yards to the southwest. 10 Pedders Lane, Preston, PR2 2TH — 1387 yards to the south. Preston — 1032 yards to the west. Banks Road, Fulwood, Preston, PR2 3RS — 1594 yards to the east. Preston — 1473 yards to the northwest. Preston — 1381 yards to the east. Preston, PR2 1 — 1636 yards to the southeast. Preston — 1414 yards to the southeast. 3-5 Catforth road, Preston, PR21AW — 1173 yards to the southwest.